With Sign Kits for Mobile In-House Sign ShopÂ®, users can create custom, professional looking signs in variety of sizes and shapes. Kits include white, 3 mm PVC signboard pre-cut in variety of sizes; 16 in. 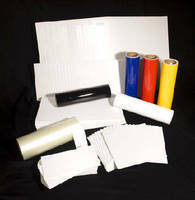 x 50 ft rolls of 3.0 mil thick, Sigma 16 vinyl with high-gloss finish in variety of colors; application tape; and squeegee. Sign Kits are available for creating 32, 64, or 96 standard size signs. BYRON CENTER, MI - Visual Workplace, Inc. introduces Sign Kits for the Mobile In-House Sign Shop® (MIHSS). Sign Kits combined with the MIHSS create a complete sign making solution that enable users to quickly and easily create durable, custom and professional looking signs in a variety of sizes and shapes to satisfy specific indoor or outdoor needs, at a fraction of the cost of having to purchase signage from a third party. Sign kits include white, 3mm PVC signboard pre-cut in a variety of sizes, 16 in. x 50 ft. rolls of durable, 3.0mil thick Sigma 16 vinyl with a high gloss finish in a wide range of colors, application tape and squeegee. Sign Kits are available for creating 32, 64 or 96 standard size signs. The MIHSS is an affordable tool that makes quality, high-impact signs easily, to support 5S, Lean, and safety programs, and other departments within an organization. The heart of Visual Workplace's product line is the Mobile In-House Sign Shop®, which enables users to make professional, custom signs quickly and easily at a fraction of the cost to buy signs from a third party. Visual controls are made at the point of use, exactly when they are needed, so the momentum and progress of 5S and Lean programs is uninterrupted. The Mobile In-House Sign Shop makes it easier to kick off and sustain 5S and Lean programs. Request a live demonstration of the Mobile In-House Sign Shop today. For more information visit www.visualworkplaceinc.com, email info@visualworkplaceinc.com, or call 1-616-583-9400.